To determine the association between circadian pathway genetic variants and the risk of prostate cancer progression. We systematically evaluated 79 germline variants in nine circadian pathway genes in a cohort of 458 patients with localized prostate cancer as the discovery phase. We then replicated the significant findings in another cohort of 324 men with more advanced disease. The association of each variant with prostate cancer progression was evaluated by a log-rank test and Cox regression. A single nucleotide polymorphism of the neuronal PAS domain protein 2 (NPAS2) gene (rs6542993 A>T) was found to be associated with a significantly higher risk of disease progression in both localized (P = 0.001) and advanced (P = 0.039) prostate cancer cases. In silico analysis revealed decreased expression levels of NPAS2 in carriers of the T allele of rs6542993 compared with those carrying the A allele. Consistently, downregulation of NPAS2 expression was associated with more aggressive prostate cancer and poor progression-free survival (log-rank P = 0.002). The NPAS2 rs6542993 polymorphism may be a promising biomarker, and may shed light on the pathways that govern prostate cancer progression. The online version of this article ( https://doi.org/10.1186/s12935-019-0811-4) contains supplementary material, which is available to authorized users. The circadian rhythm is driven by an internal biological clock, which allows organisms to sustain an approximate 24-h cycle of physiological activities such as the sleep–wake cycle, basal metabolism, hormone production, and immunity . The core circadian clock is mainly generated through a series of transcriptional/translational feedback loops. In the morning, clock circadian regulator (CLOCK) and neuronal PAS domain protein 2 (NPAS2) form heterodimers with aryl hydrocarbon receptor nuclear translocator like (ARNTL), bind to E-box enhancer elements, and activate the transcription of period circadian regulators (PER1, PER2, PER3) and cryptochrome circadian regulators (CRY1, CRY2) [2, 3, 4, 5]. Late in the day, PERs and CRYs heterodimerize and activate a negative feedback loop, which directly suppresses transcriptional activity of the CLOCK/ARNTL complex. The suppression of CLOCK/ARNTL is released through the degradation of PERs and CRYs by casein kinase 1 epsilon (CSNK1E) and ubiquitin-mediated pathways . After PERs and CRYs are degraded, the entire cycle repeats with a periodicity of approximately 24 h.
Shift-work, sleep deprivation, jet lag, and light exposure at night potentially cause circadian disruption, which has been linked to the risk of various diseases such as diabetes, depression, cardiovascular problems, and cancer [7, 8, 9, 10]. In particular, the International Agency for Research on Cancer classified shift-work with circadian disruption as a probable human carcinogen (Group 2A) . A few candidate gene studies have examined the associations between circadian genes and several cancers [12, 13, 14, 15, 16], including prostate cancer. The association between circadian gene variants and prostate cancer risk has been described in several case–control study in Chinese and Caucasian population [13, 17]. However, an alternative study failed finding any association of 96 variants across 12 circadian-related genes with fatal prostate cancer using three patient cohorts . Therefore, this gene-disease association remains inconsistent, and very few studies have assessed the prognostic values of these genes. Based on accumulating evidence for a relationship between the circadian rhythm and cancer, we hypothesized that genetic variants in circadian pathway genes might have impacts on the prognosis of patients with prostate cancer. To test this hypothesis, we systematically evaluated the influence of 79 circadian gene variants on disease progression in patients with localized prostate cancers and then verified the findings in another group of patients with advanced prostate cancers. A total of 458 patients with localized prostate cancer who underwent radical prostatectomy as initial treatment and 324 patients with advanced prostate cancer who were on androgen-deprivation therapy (ADT) were included in the present study. The recruitment process and patient characteristics were described previously [19, 20, 21, 22]. In the localized prostate cancer cohort, biochemical recurrence (BCR) was defined as two consecutive prostate-specific antigen (PSA) level increments of > 0.2 ng/mL during an interval of > 3 weeks [23, 24]. In the advanced prostate cancer cohort, disease progression was defined as a serial rise, at least two rises over 1 week apart, in PSA over the nadir [25, 26]. Initiation of secondary hormone treatment for patients with a rising PSA level was also considered as a progression event. This study was performed in accordance with the approval procedures by the Institutional Review Board of Kaohsiung Medical University Hospital, and written informed consent was obtained from all patients. TagSNPs were chosen from nine circadian-related genes (ARNTL, CLOCK, CRY1, CRY2, CSNK1E, NPAS2, PER1, PER2, and PER3) using the Tagger pairwise method  based on an r2 value of 0.8 or higher and a minor allele frequency of at least 0.2 in the HapMap Chinese Han population . Ultimately, a total of 96 SNPs were selected for genotyping. Genomic DNA was extracted from peripheral blood samples using the QIAamp DNA Blood Mini Kit (Qiagen, Valencia, CA, USA). Genotyping was performed as described previously  using Agena Bioscience iPLEX matrix-assisted laser desorption/ionization time-of-flight mass-spectrometry technology at the National Center for Genome Medicine, Taiwan. Any SNP that failed at assay design (N = 7), deviated from Hardy–Weinberg equilibrium (P < 0.01, N = 5), or fell below a genotyping call rate of 0.85 (N = 3) was removed, leaving 79 SNPs for further analysis. The average genotype call rate was 99.2%, and the concordance rate was 100% among 10 duplicated samples. 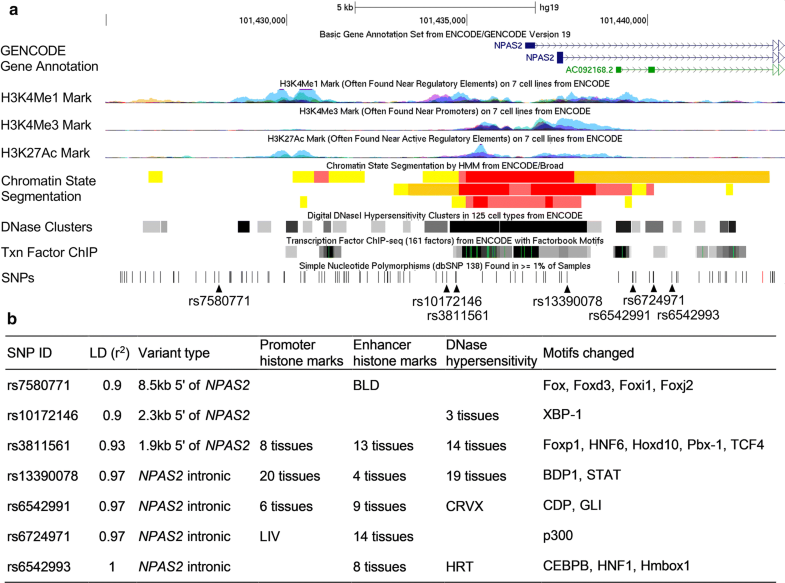 We annotated the regulatory potential of the region adjoining the tagSNPs using HaploReg v4.1  and ENCODE . The GENe Expression VARiation (Genevar) database was used to identify potential SNP-gene expression quantitative trait loci (eQTL) associations within a locus . The prognostic effect of NPAS2 on prostate cancer was analysed using datasets from Memorial Sloan Kettering Cancer Center (MSKCC) Prostate Oncogenome Project . Kaplan–Meier analysis with the log-rank test was first used to assess the association of time to disease progression with each tagSNP under dominant, recessive, and additive models of inheritance. Since many tagSNPs were analysed, we conducted bootstrap resampling  to internally validate the significance of the tagSNPs by performing 1000 bootstrap runs. The risk of disease progression was estimated using the hazard ratios (HRs) and 95% confidence intervals (CIs) obtained by multivariate Cox regression adjusting for age, PSA level at diagnosis, pathologic Gleason score, and pathologic stage in the localized prostate cancer cohort , or adjusting for age, PSA level at ADT initiation, biopsy Gleason score, clinical stage, PSA nadir, and treatment modality in the advanced prostate cancer cohort . Nonparametric analysis of variance followed by post hoc multiple comparison tests were applied to compare the level of NPAS2 expression with clinical characteristics of the patients. All statistical analyses were performed using Statistical Package for the Social Sciences (SPSS) software version 19.0.0 (IBM, Armonk, NY, USA), and a two-sided P value of < 0.05 was considered statistically significant. The clinical characteristics of the study groups are presented in Table 1. The median age of the patients in the localized prostate cancer cohort was 66 years. Over a median follow-up time of 54 months, 184 (40.2%) of the patients experienced a disease relapse. The median age of patients in the advanced prostate cancer cohort was 72 years, and 296 (91.4%) patients progressed to castration-resistant prostate cancer during the median follow-up of 93 months. In the localized prostate cancer cohort, we screened 79 SNPs within nine circadian-related genes. NPAS2 rs6542993 was significantly associated with BCR (P = 0.039, Table 2 and Fig. 1a), while no significant association was detected for the other selected variants (Additional file 1: Table S1). The prognostic value of rs6542993 remained significant with 1000 bootstrap resampling (P = 0.042, Table 2), and in multivariate analysis after adjusting for age, PSA level at diagnosis, pathologic Gleason score, and stage (HR 1.50, 95% CI 1.18–1.91, P = 0.001; Table 2), providing support for the validity of this result. Interestingly, NPAS2 rs6542993 was also found to be associated with an increased risk of progressive disease (HR 1.32, 95% CI 1.01–1.71, P = 0.032; Table 3 and Fig. 1b) after adjusting for known clinicopathological variables that are associated with advanced prostate cancer, confirming NPAS2 rs6542993 as a biomarker for prostate cancer progression. We annotated all correlated variants within the linkage disequilibrium (LD) block (r2 ≥ 0.9) of rs6542993 with respect to regulatory elements, and predicted functional motifs catalogued in ENCODE and HaploReg (Fig. 2). All SNPs coincided with promoter or enhancer elements: five SNPs are located in DNase hypersensitivity domains and are predicted to alter transcription factor-binding motifs, suggesting that these SNPs could influence gene expression. Genevar analysis using HapMap data to investigate the association of these SNPs with NPAS2 expression demonstrated that rs6542993 and linked SNPs coincide with a probable eQTL and are the best candidates to influence NPAS2 expression. The risk allele T of rs6542993 was associated with a decreased NPAS2 expression level in the HapMap Han Chinese in Beijing (CHB) population (empirical P = 0.005, Fig. 3). We further evaluated the association of NPAS2 expression with prostate cancer outcome using the MSKCC Prostate Oncogenome Project data. Consistently, the NPAS2 gene expression level was significantly lower in cases of more aggressive forms of prostate cancer (P ≤ 0.003, Fig. 4a, b), and a low expression level of NPAS2 was associated with poor BCR-free survival in patients with prostate cancer (P = 0.002, Fig. 4c). We conducted a two-stage study to investigate the effects of common germline genetic variants in the circadian pathway on the prognosis of prostate cancer patients. Among the 79 variants assessed in nine genes, NPAS2 rs6542993 was identified as an independent prognostic factor for prostate cancer progression across both cohorts. In addition, bioinformatics analysis provided further evidence that rs6542993 is an eQTL that affects the expression of NPAS2, and down-regulation of NPAS2 expression was correlated with a shorter progression-free survival of prostate cancer patients. Overall, these findings highlight the importance of NPAS2 in prostate cancer progression. The risk variant rs6542993 is located in the intronic region of NPAS2, displaying histone marks with transcriptional enhancer activity. In addition to rs6542993, multiple SNPs in high LD were also identified as significant eQTLs for NPAS2. In fact, rs10172146, a SNP in high LD (r2 = 0.9) with the risk allele, showed a strong association with NPAS2 expression. 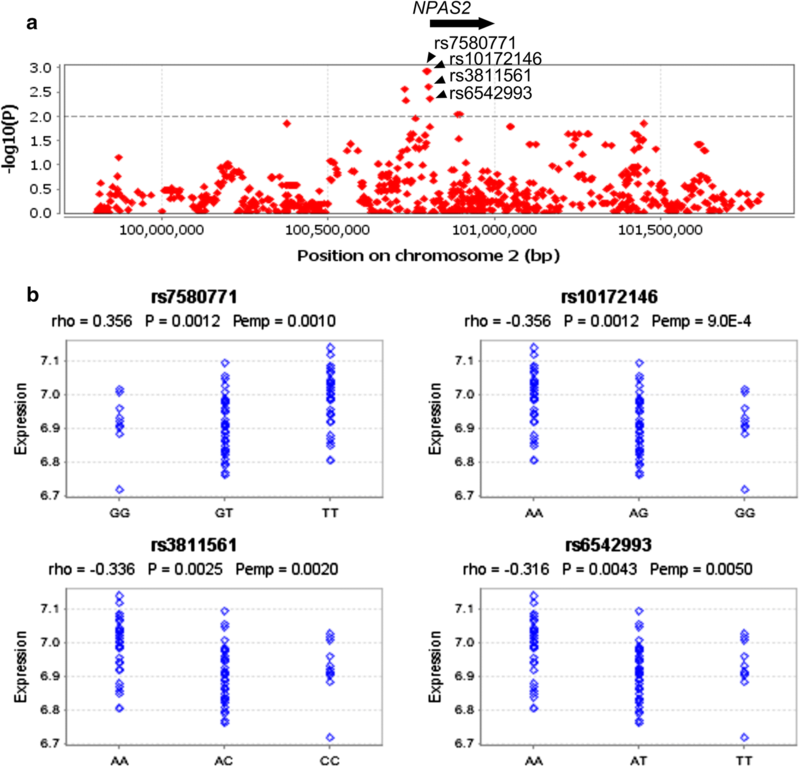 The risk allele rs6542993 T was associated with reduced levels of NPAS2 expression. Only a few studies have examined the role of circadian gene variants on prostate cancer risk, with some suggestive general associations reported [13, 17, 18]. NPAS2 has consistently emerged as one of the top genes with the greatest contribution to the observed statistical association between the circadian pathway and risk of prostate cancer in two meta-analyses of data from genome-wide association studies [37, 38]. NPAS2 is suggested to be a putative tumour suppressor playing an important role in transcriptional suppression of the protooncogene c-Myc , DNA damage response , and cell cycle control by regulating diverse downstream genes . In addition, NPAS2 has been identified as a prognostic biomarker in breast and colorectal cancers [42, 43], in which reduced NPAS2 expression was associated with decreased disease-free and overall survival rates in patients with breast cancer , in line with our present results in patients with prostate cancer. 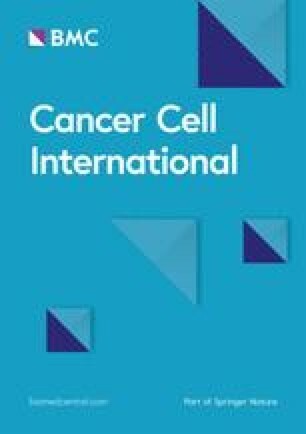 Silencing NPAS2 expression promoted the proliferation, invasion, and wound healing abilities of colorectal cancer cells , indicating a crucial role of NPAS2 in tumour growth and metastasis. We found no association between NPAS2 rs6542993 polymorphism and prostate cancer risk when comparing our patient population to 1500 healthy controls from the Taiwan Biobank (data not shown). The NPAS2 gene expression levels also did not vary significantly when comparing prostate cancers and normal tissues using the MSKCC Prostate Oncogenome Project data. These data suggested that NPAS2 might play a role in prostate cancer progression but not in prostate cancer initiation. However, the functional roles of NPAS2 in prostate cancer progression remain largely unclear and need further investigation. The modest sample size of both cohorts included in this study did not allow for optimal statistical power to detect associations; therefore, the observed P values could not reach a more stringent significance level to avoid multiple comparisons. However, the association between NPAS2 rs6542993 and prostate cancer progression was replicated across two independent and different types of cohorts, which largely reduces the chance of false-positive findings. In addition, functional analyses support the role of NPAS2 rs6542993 in patient prognosis. Since the tagSNPs evaluated in this study were selected based on haplotype diversities, the linked causal variants remain to be determined. Since circadian genes are expressed in a circadian manner, the timing of specimen collection and the measurements of genetic variants and gene expression should be consistent in the same population. Another potential limitation of the study is that our findings may not be generalized to other ethnic groups since the majority of patients in both cohorts were Taiwanese. However, this may also be a benefit of our study in reducing the effects of population heterogeneity to more clearly detect an association. Nevertheless, further independent, larger, and inter-ethnic studies, as well as functional experiments are needed to validate our findings. This is the first attempt to systematically evaluate the effect of genetic variants in the circadian pathway on prostate cancer progression. NPAS2 rs6542993 was consistently associated with disease progression after adjusting for clinical confounders in two independent prostate cancer cohorts. This SNP might affect prostate cancer progression by reducing the expression level of NPAS2. Thus, our findings might help to improve understanding of the interaction of circadian dysfunction and prostate cancer progression, and can provide a promising biomarker toward realizing the personalized management of patients with prostate cancer. C-CY, VCL, C-YH, I-LL, S-PH, and B-YB conceived and designed the experiments. L-CC, C-YC, Y-JC, T-YC, and T-LL performed the experiments and analyzed the data. All authors read and approved the final manuscript. We thank Chao-Shih Chen for data analysis, and the National Center for Genome Medicine, Ministry of Science and Technology of Taiwan, for technical support. The results published here are based in part on data generated by the HapMap, HaploReg, and MSKCC Prostate Oncogenome projects. All authors approved publication of the manuscript. This study was performed in accordance with the approval protocols by the Institutional Review Board of Kaohsiung Medical University Hospital, and written informed consent was obtained from all participants before the questionnaire interview and specimen collection. This work was supported by the Ministry of Science and Technology of Taiwan (Grant Nos: 103-2314-B-037-060, 104-2314-B-650-006, 104-2314-B-037-052-MY3, 105-2314-B-650-003-MY3, 106-2314-B-039-018, and 107-2320-B-039-010), the Kaohsiung Medical University Hospital (Grant No: KMUH106-6R57), the E-Da Hospital (Grant Nos: EDPJ104059, EDPJ105054, EDPJ106038, and EDAHP104053), and the China Medical University (Grant Nos: CMU106-S-24 and CMU107-S-42). The funders had no role in study design, data collection and analysis, decision to publish, or preparation of the manuscript. Additional file 1: Table S1. Genotyped SNPs and the P values of their association with biochemical recurrence after radical prostatectomy.